Safranbolu Ottoman Mansions Pictures, Images & Photos. Turkey. 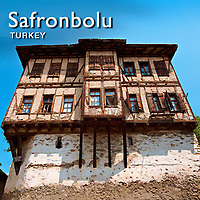 Pictures & images of the Ottoman Turkish architecture of Safranbolu, Turkey. Safranbolu derives its name from the Saffron the city traded had 3 caravanserais, overnight stopping places for camel caravan trains. Conquered during the Turkish expansion into Anatolia in the 11th century, the town still has many Ottoman Turkish style buildings. The town is one of the most complete from this era possibly due to the continuing importance of the Saffron trade in the area. The half timbered Ottoman style houses sit high on windowless stables rooms. Each mansion had a male and female (harem) area and were well insulated. They are characterised by their overhanging eves and rooms that jut out from the building supported by wooden braces. The caravan trade of the Silk Route reached its peak in the 16th century before its eventual demise to shipping. The importance of the architecture of Safranbolu has been recognised and it is a UNESCO World Heritage Site.